The new Starbucks emoji-themed keyboard app lets you send more than a smile. 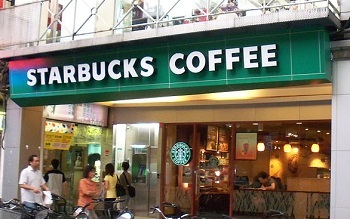 When it comes to adopting mobile technology trends, Starbucks has shown time and again that it’s a leader in this field, having released apps and being one of the first to jump on board the mobile payments bandwagon, among other advancements. Therefore, it shouldn’t come as much of a surprise that one of America’s favorite coffeehouse chains has released its very own Starbucks emoji keyboard, which lets users digitally express themselves with Frappauccinos, cake pops, iced coffee and their other favorite Starbucks products. The keyboard app is available free for both iOS and Android mobile devices and features a custom keyboard option decked out in the company’s colors and font as well as two pages of Starbucks-inspired emojis. The emoji library includes everything from drinks and treats to the logo and emoji people holding Starbucks products. To enjoy this fun new application on iPhone, users need to install it and add it to the active keyboard list under settings. They need to allow the app full access so it can be used throughout the phone. The app is activated using the globe key on the bottom line on the standard keyboard. The emoji keyboard functions like most third-party keyboard apps and works with most major messaging apps including Facebook, WhatsApp, and iMessage. On the flip side, Android users will find the activation process similar to iOS. After installing the app, it can be activated under Language & Input in Settings and should be selected as the standard keyboard. Via Android, the program sends emojis as images through apps instead of placing them within messages. Could the Starbucks emoji keyboard evolve into something more in the future? Many consumers weren’t pleased when the company changed its rewards program and app, and some hope that the new keyboard app – although currently nothing unique or ground-breaking for Starbucks – could be the start of something special. Imagine: instead of just sending an emoji to a friend, what if users could actually order coffee via emoji? While that’s definitely only a sweet dream and a not reality at the moment or in the near future, lovers of this app will be pleased to know that the company intends to add more content to its Starbucks emoji keyboard app throughout the year.